Don't forget that Youth Day registration will close on Thursday, March 14! If you have questions about your registration, contact Sarah at salas@la-archdiocese.org or (213) 637-7348. I wanted to send this announcement so that you would be informed of a recent development in the ORE. Some days ago, our Coordinator of Youth Ministry, Victoria Radleigh Smith, was admitted to the hospital with a serious medical condition. She is currently receiving treatment and is doing better, but we foresee that she will be out of the office for some time as she recovers. We (as well as Victoria) would deeply appreciate your prayers and support during this difficult time. I pledge that we, as the ORE, will strive to continue the service you need. For those youth ministry coordinators working in the pastoral regions that are Victoria's responsibility, I ask that you direct any questions or concerns to Katie Zeigler at (213) 637-7616 or kzeigler@la-archdiocese.org or to Kelly McLoughlin at (310) 663-8639 or at kamcloughlin@sbpr.org . Thank you for your attentiveness to this message and I hope I will see many of you in a couple of weeks at RECongress. It might be hard to believe, but we are just 22 days away from Youth Day 2019! We can't wait to welcome teens from throughout the Archdiocese and beyond to joyfully celebrate our Catholic faith and renew their commitment to Trust! God's Gotchu. See you on March 21! Tickets for Youth Day are still available. Registration will close on Thursday, March 14 or when all tickets sell out. Register now to ensure you don't miss out. There is still one day remaining to register at the special discount price of $35 per ticket. February 28 is the final day to receive this special rate! Starting on Friday, March 1, the regular registration rate of $40 per ticket will be in effect. Eucharistic Ministers: Anyone who is trained as a extraordinary minister of Holy Communion is invited to assist. A short training 20 minutes before the Mass will take place at the Convention Center. Collection: Young people are always needed to assist with the Youth Day collection. Consider signing up your group to assist in this way. As a reminder, young people participating in these roles will need to be accompanied by an Adult Chaperone. Liturgical Ministers: serve within the Eucharistic Mass as a cross bearer, candle bearer, gift bearer, altar server, extraordinary ministers of Holy Communion, or lector. Ministers of Movement: lead the assembly in dance, liturgical movement, and ritual gesture. General Session Host: be part of skits, spoken word, and narration in front of a large audience. Workshop Emcee: introduce our workshop speakers, and presenters. Lead participants in opening and closing prayer. Social Media Team: help to capture the day with images, content, and usable quotes. Spirit Squad: help to pump up the crowd and get participants excited about Youth Day. All interested young people must register for Youth Day Recruitment Day in advance. Join us on Saturday, November 10, 2019 from 9-2 at St. Monica's Parish in Santa Monica. 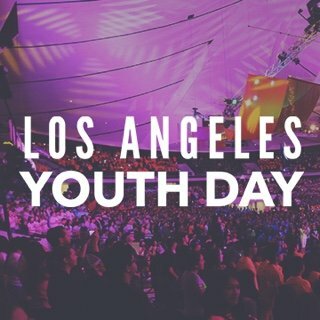 Youth Day is held Thursday, March 21, 2019 at the Anaheim Convention Center. Cost is $40 per participant with special discount pricing of $35 being extended through February 28, 2019. Groups can register online or by mail. When registering for Youth Day, groups will be asked to provide basic contact information for their group, such as parish/school name, group leader contact information, and the names of their chaperones. Groups will also need to select their preferred track. This year, groups will NOT be asked to submit the names of young people. Instead, they will simply purchase a number of youth badges. In keeping with our policy of having 1 adult for every 10 young people, groups will be able to purchase up to 10 youth badges for every chaperone name they enter. This means a group that has 4 chaperones will be eligible to purchase up to 40 youth badges. A group with 6 chaperones will be eligible to purchase up to 60 youth badges. Please keep in mind that 2 chaperones will be required for the first group of 10 young people. For more information regarding Chaperone and Safe Environment Policies, please click here. Groups will also NOT be asked to select their workshops in advance. All workshops will be selected at Youth Day. Each participant will experience two workshops at Youth Day. These workshops will be presented on a variety of topics by nationally acclaimed experts in the field of Youth Ministry. Workshop rooms will be set with either theater seating (traditional), round tables or an open floor plan to allow for greater engagement. Workshops will no longer be selected in advance. Instead, groups will be able to select workshops on site at Youth Day. This will allow young people the freedom to select workshops and speakers that best suit their needs and interests. Providing that young people are chaperoned at all times, larger groups are welcome to split their group into smaller groups that attend different workshops. Room capacities will be larger to ensure that as many young people as possible are able to attend their preferred workshop. In the event that a room reaches capacity, groups will be directed to select another workshop. Youth Day will continue to feature a two-Track system. Both Tracks will experience a General Session in the Arena (which includes a keynote, liturgy, music and rally) as well as two workshops in the Convention Center. Youth Day will now feature a staggered start and end time. Whether your group prefers to arrive early or beat the crowd and avoid traffic, we have an option for you. We have eliminated the Opening and Closing Sessions (previously held in Hall B), which allows for a greater passing period between Workshop 1 and Workshop 2. All Youth Day programming will take place in ACC North (the new Convention Center expansion) or in the Arena. This means that workshops, Sacred Space, Youth Day exhibits, and all other activities will be on either the first (Level 100) or second floor (Level 200) of ACC North. Keeping all workshops in close proximity to one another will help ensure that your group will have time to select another workshop in the event that your preferred workshop selection is full. This will also allow groups the chance to focus more on the events of the day and worry less about having to move their group across the Convention Center. Lunch options will continue to be accessible throughout the Convention Center and on the Grand Plaza. Mark your calendars for Youth Day 2019 held at the Anaheim Convention Center on March 21, 2019. Youth Day registration is $40 per participant. Discount pricing of $35 will be extended through February 28, 2019. The weekend continues with the adult days, March 22-24, 2019. Registration for the adult days is $85 per participant, with discount pricing of $75 until February 22, 2019.